Search for all types of paintball places in Staten Island that are fun for kids and adults alike. Take advantage of the most fun paintball Staten Island has to offer by browsing through our comprehensive guide to paintball in Staten Island. Great Paintballing in Staten Island! 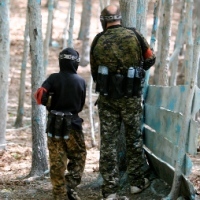 If you're searching for the best Staten Island paintball fields, Cousins Paintball is a wonderful outdoor park with 20 acres of woods with hills, streams, and bunkers. The company specializes in bachelor parties, religious groups, and company outings. Private groups of 10 or more people can play any day of the week (Monday through Friday), as long as you make reservations about two weeks in advance and submit a pre-paid deposit. All reservations are based on availability. The food at the facility is made to order by Staten Island's Empanada Mamma's Grill. The outdoor park is open to the public on Saturdays and Sundays, from 9 A.M. to 5 P.M.